Notes: 3-bolt mounting. Works with EFI and carbureted engines. I received this starter and went to go get it checked and the starter look good on the outside but it popped out the main gear but wouldn't spin and was locked up. I took the old one off and installed the new one turned the ignition and it fired the engine up super fast I am very happy with my new Powermaster starter best one I had ever installed. The starter has a lot of power! Power Max is what it truly is power. 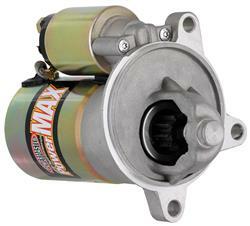 great starter, I installed it on a mustang dirt track car with a 2500 ford engine, works great, tried stock starters, just couldn't get the torque to crank the high compression engine. But this starter does a great job!! !